SUCCESSFUL SPRING AUCTION Outstanding results for Africa, Air Mails, Boer War, India, Isle of Wight and Kent. Philatelic market soundly underpinned. Total realisations £344,248 including premium. Following a busy viewing session at London’s Stampex Show, allied with strong interest from around the world, there was an air of anticipation at Argyll Etkin’s Spring Auction as some fascinating properties came on offer. The day began with Airmails, including the first solo flight by Mrs. H. Bonney, an important early Lady Aviator, who flew from Brisbane to South Africa via Egypt, which took some four months. A charming group of three covers sold for £350. Remaining in Africa, a 1935 cover from Brazil to Gambia by the Zeppelin Airship sold for £2,350; a very scarce cover as there were no mooring facilities at Bathurst and the mail had to be dropped to the ground. Alan Cobham’s 1925 flight from London to Cape Town was marked by a special postcard to the editor of Flight Magazine in London signed and posted by Cobham after his arrival at Cairo on December 7th. This card sold for £720. Military items began with a 1761 entire letter from a naval officer at Belle Isle in the Detroit River between mainland U.S.A. and Canada, put into the post at Weymouth, which made £400. A group of letters from the King’s German Legion who fought for the British in the Napoleonic Wars was most interesting and sold for £1,550. The Anglo Boer War was well-represented and included a 1900 cover from a British P.O.W in Pretoria Prison, which only held a few Colonial officers and troops, sent to Kroonstad, O.F.S; this sold for £1,550. An exceptional collection of Hospital Ship mail included a postcard from the Ladysmith Siege to H.M. Hospital Ship Trojan in Durban which sold for £880. An 1860 cover from Leeds to Hospital Ship Melville at Hong Kong during the Second Opium War was keenly sought as it bore a rare Hong Kong single arc datestamp, with date omitted. This cover brought £2,700. A Belgian Congo postcard from the British Naval Forces on Lake Tanganyika during the first World War, written from Kindu to South Australia in 1916 made £1060. A censored cover from Palestine to Slave Island, Ceylon in 1918 was keenly fought for reaching £590. World War Two saw an extraordinary 21/2d letter card cancelled by the distinctive ‘L.P.R. / 6 August 1941 / Mobile P.O. No 1’ used in London E.C. on this one day only after much of the East End and East Central London was destroyed in the blitz, this postmark only used on registered mail – this brought £475. Australia saw a very early entire letter from York, Western Australia dated 25th October 1838. The writer ‘can only spare a few minutes as we are in the midst of shearing the sheep’. He reports that ‘We expect a change very shortly in the Government as a new Governor is expected very shortly. Sir James Stirling will leave immediately that the Britomart arrives with official despatches that he is to be removed. A Mr. Hatt has been appointed to succeed him. I hope we will find him independent and will have no prejudice to bear him as Sir James who always took an opportunity of favouring any district to which his own land was situated’. An important early letter which sold for £2,000. Also in the southern hemisphere, a stunning cover sent by the Falkland Islands Governor Sir Arnold Hodson from South Georgia self addressed to Government House in Port Stanley franked by a vertical marginal pair of 21/2d on 2d provisional surcharges, only in use from 7th to 22nd February 1929 during a shortage of regular 21/2d stamps sold for £3,525. A terrific group of Indian States material was keenly bid – a collection of Convention States selling for £2,250 while a collection of Jaipur reached £2,000. The very rare Bhopal 1949 Service 2a on 11/2a claret SG 0357 reached £1,540 and Kishangarh 1899 Imperf 1/2a red used SG 8 made £1,400. Southern Africa featured a lovely collection of Cape material from the George district with particularly keen demand for an 1861 cover from Knysna bearing an 1861 4d pale grey-blue woodblock which reached £890. A George 1901 cork card with central segment of diamonds and triangles made £500 and a rare pair of covers with Great Brak River cork cancels brought £890. Great Britain saw a fine Revenue collection in hot demand with a group of nine stamps and licences from 1780 to 1835 making £520. GB continued with the renowned R.C. Alcock’s number in Maltese Crosses collection realising £2,470. A fine holding of Philatelic Congress items between 1909 and 1993 brought £1300. An 1846 green wrapper used to enclose Registered letters, sent from Liverpool to Ripon, brought £830. Remarkable holdings of Isle of Wight material were keenly sought including a picture postcard with a superb 1909 strike of HIS MAJESTY’S YACHT cds making £250. An 1878 printed cover from Ryde depicting a Chinese man balancing on a teapot and holding a bamboo pole from which the 21/2d stamp is suspended made £550. Twelve lots of Prisoner of War letters from ships moored between Ryde and Portsmouth in World War One were keenly sought, realising between £350 and £1300 each. Good material from the Kent estuary towns of Dartford and Gravesend brought £1410 and £2,350 respectively. 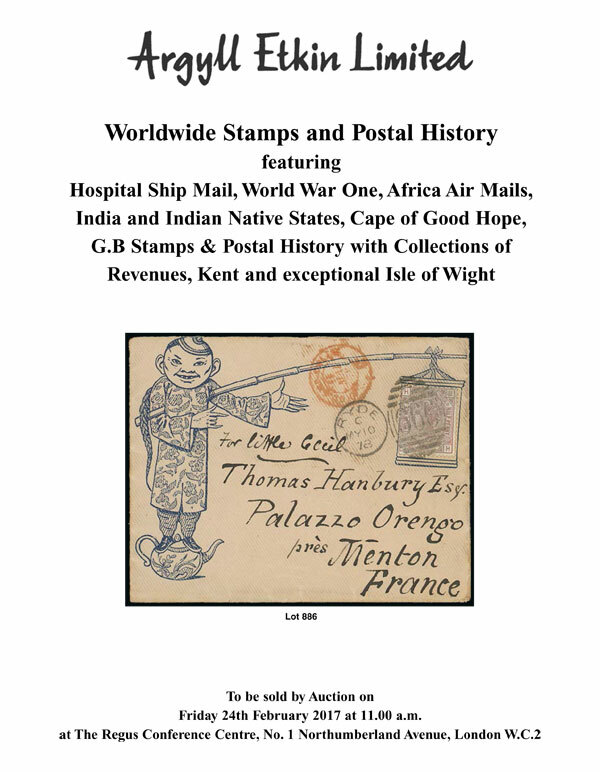 A good range of stamps and postal history found a broad range of new homes around the world. Our best wishes to vendors and buyers alike.